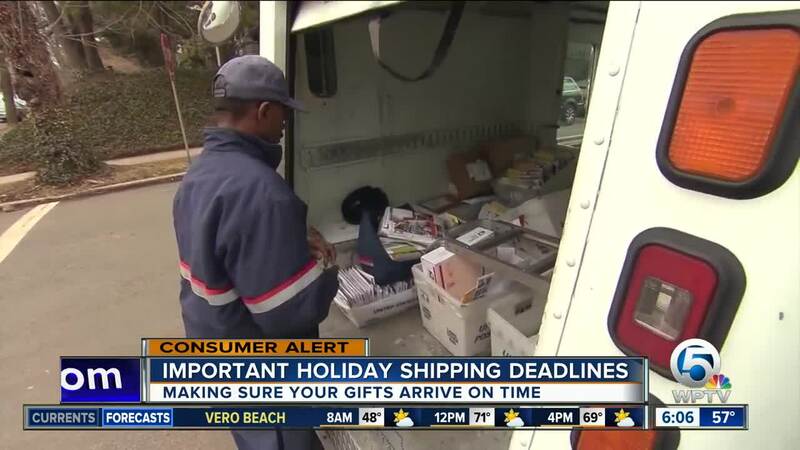 ROYAL PALM BEACH, Fla. — If you want your gifts to make it to family and friends in time for Christmas, time is running out to get to the post office. USPS says Thursday, December 20 is the shipping deadline for Priority Mail and First Class Mail to get delivered by Christmas Day. If you need more time, you can ship with Priority Mail Express by December 22. Those deadlines are for the U.S., excluding Alaska and Hawaii, which may vary. If you are shipping internationally, deadlines may vary as well. USPS also offers a Click-N-Ship service, which allows you to print shipping labels from home, schedule a package pickup and more. FedEx and UPS also have similar shipping deadlines.